“Let him sit alone in silence, for the Lord has laid it on him” (Lamentations 3:28). As believers in Christ Jesus, we can take heart that we are never alone. “I lie awake; I have become like a bird alone on a roof” (Psalm 102:7). Some of us have seasons of loneliness because of broken relationships. This could be because of separation/divorce, strained familial bonds, or misunderstandings between friends. In many cases, pride in us or others can bring division leading to being alone. Restoration takes both parties coming to a place of agreement and that’s not always possible. However, if we have sinned against anyone in a situation, we must take responsibility to confess and seek forgiveness. In doing so, we may gain a brother or sister or if they refuse to accept our request—then we are free to move forward and let God bring new people to our lives. “For none of us lives for ourselves alone, and none of us dies for ourselves alone” (Romans 14:7). Some of us have loneliness because we are waiting for God to send people our way. While the Lord may lead others to befriend us, many times it’s up to us to make the first move. When we reach out to others, we allow the Holy Spirit to reveal true friendships to us. The body of Christ is a group of Christians worshiping and serving God together. None of us were meant to be alone in the building of God’s kingdom—we need each other to strengthen and encourage one another in these evil days. We can pray for courage and discernment from the Holy Spirit to lead us to those we can minister to or receive ministry from them. Jesus set the example of withdrawing to the lonely places (sometimes without His disciples) to commune with His Father. 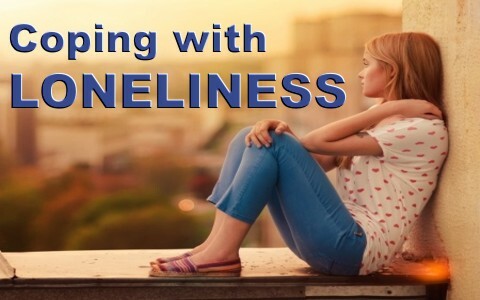 Loneliness is not always a bad thing. There are seasons in our lives when we need to pull away from people to reconnect and hear from God. The world around us is loud, evasive, and distracting from the quiet reflections and meditations necessary to grow up spiritually. Those believers most used by God have disciplined themselves to be alone—sometimes for brief periods throughout a week or even extended number of days as available. Believers who use this time for getting to know God better find themselves stronger in days of temptation and trials. The devil would prefer for us to become anxious about loneliness; yet what he meant for evil, God turns for our good. In the seasons of loneliness, we find ourselves in a place of trusting in God like we would’ve never done with many people surrounding us. Just like the seasons of nature have a beginning and end—so does our seasons of loneliness. Many of us come out of these seasons stronger in our faith and more determined to live out the calling of God on our lives. As believers in Christ Jesus, we can take heart that we are never alone. God is and will always be with us throughout eternity. We also can be encouraged that He allows seasons of loneliness to prune and prepare us for the next steps of our journey. We are not forsaken but rather loved deeply enough to have times of restoration and healing with our God and Savior Jesus Christ. I really enjoyed reading this article. Thank you for sharing it with us! I needed this so much in this exact moment. Thank you. To JCW – so sorry for your pain. Praying for comfort and strength for you. Previous post: What Does The Bible Say About Church Government?